Amid Smoking Decline, Look Who's Still Lighting Up : Shots - Health News Analysts say the merger of Reynolds American and Lorillard is driven by the changing demographics of smoking. But the lower smoking rate masks a more complex and varied pattern of cigarette usage. Robin Koval is making a career of her changed tobacco habit. "I'm a child of a smoker — my father was a heavy smoker," Koval says. "Really typical to the way the story goes, I started smoking when I was 15." Now she is president and CEO of Legacy, a foundation devoted to preventing tobacco use. Koval is working in a rapidly changing landscape. 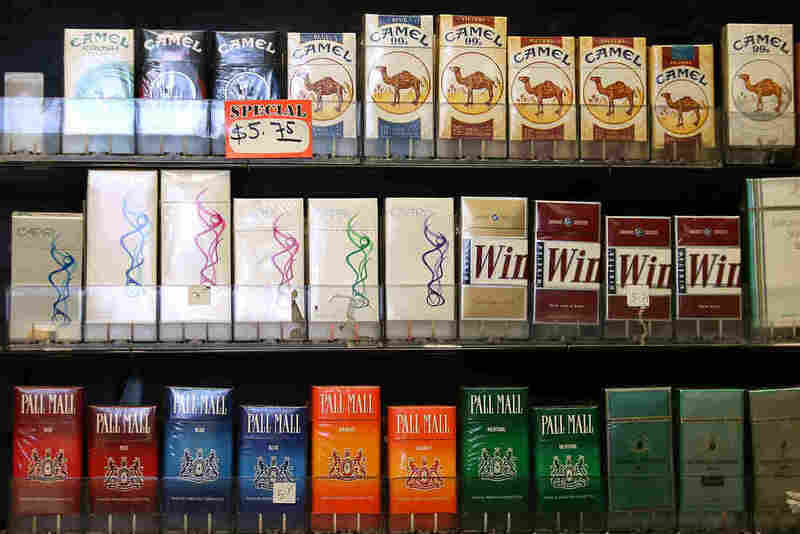 Earlier this month, Reynolds American announced plans to buy its rival Lorillard for $27.4 billion. This move alters the U.S. tobacco market and comes as the number of smokers in the U.S. continues to decline. In the 1960s, more than 40 percent of Americans smoked. Now, that's down to 18 percent. Not only are fewer people smoking, heavy smokers are consuming fewer cigarettes. "We are winning the war," Koval says. "I guess from my perspective, we'd rather win the war faster." She says the overall numbers mask a huge cultural variation. "I live in Washington, D.C.; we have a low smoking rate here. But if you go to a place like West Virginia, which has the highest smoking rate in the country, the behavior feels completely normalized," Koval says. Smoking is far more common among those living below the poverty level, those with GED-level education, and among American Indian or Alaskan Natives, according to the Centers for Disease Control and Prevention. Rates are also much higher in the lesbian, gay and transgender community. So Legacy trains educators and targets its anti-smoking message to these populations. But Koval says companies like Reynolds and Lorillard know their market well. "I think this merger, for instance, is very much about menthol," she says. "While menthol usage is declining with all cigarette usage, it's declining at a much slower rate, about half the rate, I believe, than regular-flavored cigarettes." And because menthol, a mint-flavored additive, is popular among African-Americans, the companies focus ads and coupons there. David Howard, a spokesman for R.J. Reynolds, a subsidiary of Reynolds American, acknowledges menthol is a factor in the merger. In the deal, Reynolds acquires Lorillard's Newport, the best-selling menthol cigarette and one of the few U.S. brands gaining market share. But Howard says the driving force is what he calls "smokeless" products. "For R.J. Reynolds, the focus is on innovation and providing innovative, smoke-free alternatives for adult tobacco consumers to consider," Howard says. Electronic cigarettes are a small but growing share of the market. Surprising some analysts, Reynolds will sell Lorillard's e-cigarette, Blu, to rival Imperial Tobacco Group. Instead, Reynolds is focusing on its own e-cigarette product, Vuse, that was rolled out nationally in June. Howard says he expects the market for e-cigarettes, snuff and nicotine patches could grow as traditional cigarettes continue to fall out of favor. Iris DeLutro, who is 63 and from Queens, N.Y., typifies the changing habits of smokers these days. "I've cut down dramatically," she says. "I used to smoke a pack and a half." She says she used to smoke while working at her desk. But times have changed, and so have her own attitudes. Now, she's hoping to use a patch to try to quit altogether. "I don't smoke indoors at all — my apartment is smoke-free," DeLutro says. "I don't let my grandson see me smoking." There are still enclaves where smoking is alive and well. The Midwest, where Sheila Martin lives, has a higher smoking rate than other areas and nearly double the rate in the West. "My parents smoked when I was growing up," Martin says. "I didn't know anyone whose parents didn't smoke." Martin owns a tavern in Hutchinson, Kan., which still permits smoking — it was grandfathered in under a state smoking ban. And Martin wants very much to keep it that way. "In a country where people have the right to assemble, you know, as long as tobacco is sold and sanctioned by the government, and they're making a lot of money on it, people ought to be allowed to choose," she says. But even a die-hard smoker like Martin says she may consider e-cigarettes. "If I decided I didn't enjoy it anymore, I probably would try the e-cigs," she says. There may come a time, she says, when she'll take up a smokeless alternative like some of her customers. But that day has not yet come.